Rachel Teague Mentioned in "Business Experts Can Lend a Hand"
This coming Thursday night, September 27, 2007, there will be a Spaghetti Dinner at the Shamrock to raise funds to help defray the costs of the medical treatments and transportation for Bill Cashman, Director of the Beaver Island Historical Society. The BIHS board members want to encourage all to attend and help the Cashman family. If you are unable to attend, you can still participate. Please make out a check to the Bill Cashman Medical Fund and send it to Alvin LaFreniere, P.O. Box 178, Beaver Island, MI 49782. While some of the visitors to Beaver Island do not know it, one of the most necessary and needed shops on this island is the Beaver Island Fire Department Auxiliary Resale Shop. It has a new name Island Treasures Resale Shop, and is located on Donegal Bay Road near the tennis courts. The shop will sell items donated by friends and neighbors. The resale shop is not currently open, but will begin accepting donations in the very near future. 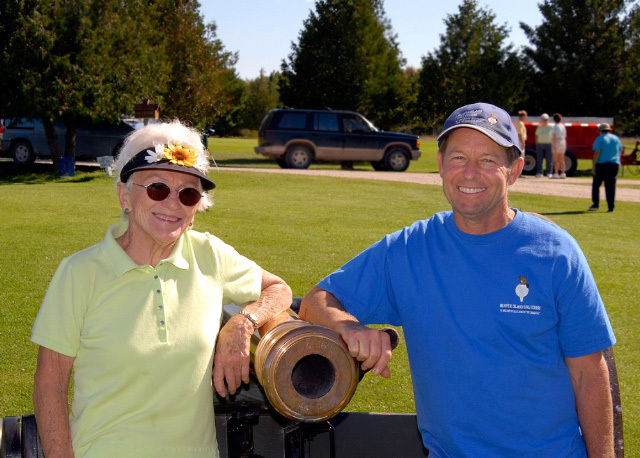 On September 23, 2007, at approximately 1 p.m., John Works, Jr, fired his Civil War replica cannon to start the first ever mixed double's golf tournament for the Beaver Island Golf Course. Organized by Buck Ridgeway in conjunction with John Works, Jr.,, the Beaver Island golfers were not quite sure this was going to work out. Amazingly, eighteen two person teams signed up and arrived on the course for the start. Considering the lateness in the season, this is quite a statement of desire to play in this format from the members and non-members of the golf course. The format was different from the everyday, almost always, scramble. The plan was to make sure that each participant was truly participating, and that no team was completely dominated by any one player. Each male member of the team drove the ball on tees 1, 3, 5. 7. and 9. Each female member of the team drove the ball on holes 2, 4, 6, and 8. After the drive, the players had to take turns playing the ball until it was put into the cup. A par on hole number one might go like this: male drive, female second shot onto the green, male putt missed but close, female holed out. "This was a lot of fun. Everyone felt like they were part of the game today," Buck Ridgeway stated. When the tournament was over, John Works, Jr. promised others like it, perhaps during the regular summer golfing season. Most of the participants really enjoyed the format, even if they did not place in the winning four team places. "We have all ages participating in the tournament as well as mixed teams," Buck continued. "We have from young elementary school students up through adults in their eighties." The results of the tournament provide an excellent example of all ages and both men and women enjoying the game of golf. 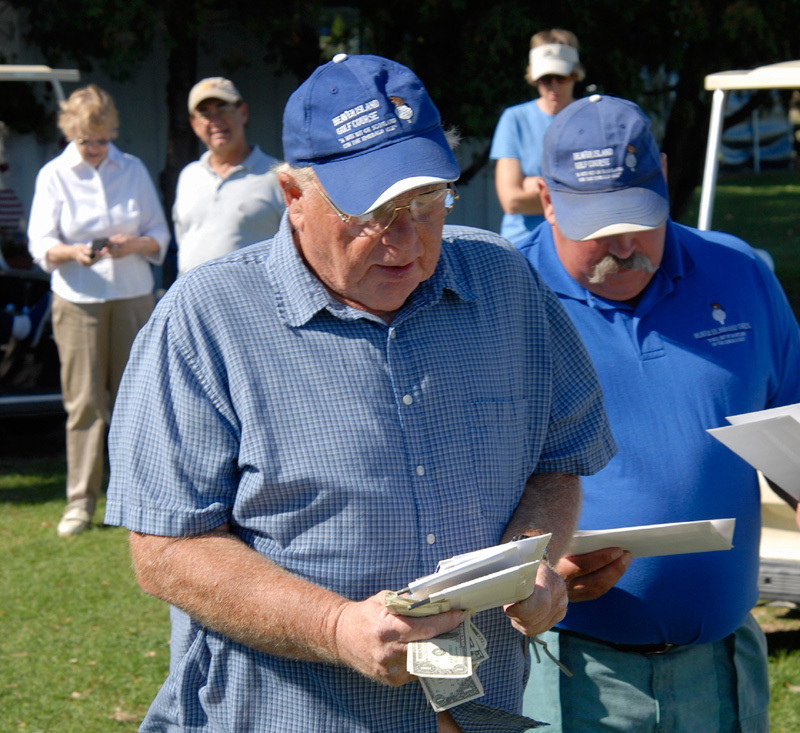 In first place with a score of 44 was the team of Larry Roy and Mary K. Dorais. In second place with a score of 45 was the team of Teresa and Larry Laurain. In third place with a score of 46 was the team of Marianne Brown and Joe Moore. In fourth place was the team of Jayne Bailey and John Roberts. Many Island residents met at the Peaine Township Hall on September 23, 2007, at noon, to thank Connie Harris for her service to Beaver Island. Connie has shared the responsibility for healthcare of the Island residents and visitors with Sue Solle. Connie is now moving off the Island and into a different role on the mainland. Sue Solle will remain the island's primary healthcare provider. We want to wish Connie and her husband John success in their future endeavors. Thank you, Connie, from the whole Beaver Island community. The Beaver Island Rural Health Center is currently seeking to hire another Family Nurse Practitioner for the Island. No one guessed correctly for the total or the individual teachers. Jim and Donna Stambaugh each taught at BICS for 20 years. Jacque LaFreniere taught at BICS for 26 years. Joe Moore taught at BICS for 30 years. The total number of years taught for all of these retired teachers is 96 years, pretty close to one hundred that the posted said. The Beaver Island Non-Denominational Christian Church is now located on Kenwabikise Lane. The early members started meeting originally in a commercial business location. What is the name of the place of these original meetings? The first correct answer will earn a gift subscription to News on the 'Net for the months of October, November, and December for the person of your choice. Paradise won Friday night. 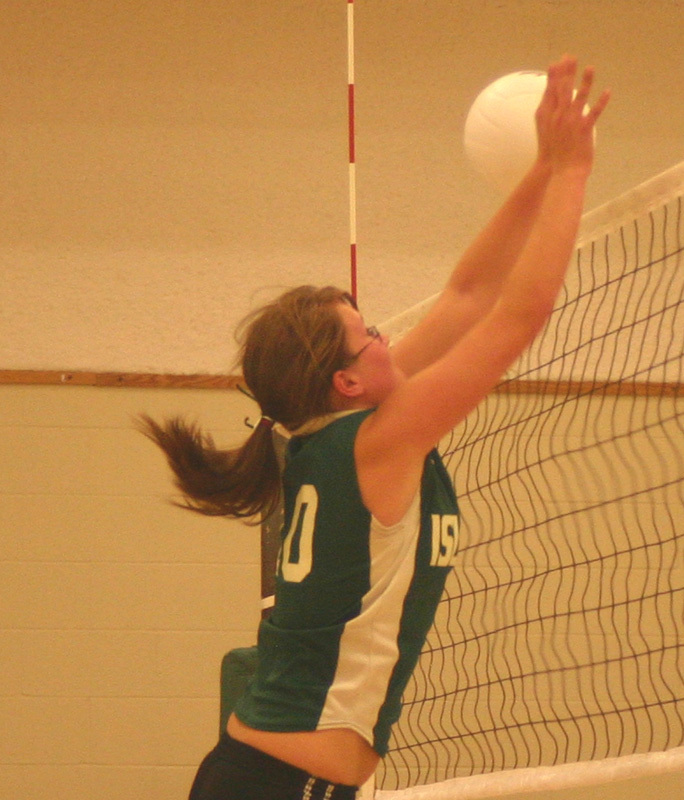 The game scores were 19-25, 25-14, 19-25, 25-22. After winning the 2nd and 4th games, we played a short 15 point tie-breaker. We lost it 7-15. Saturday morning was just as exciting. 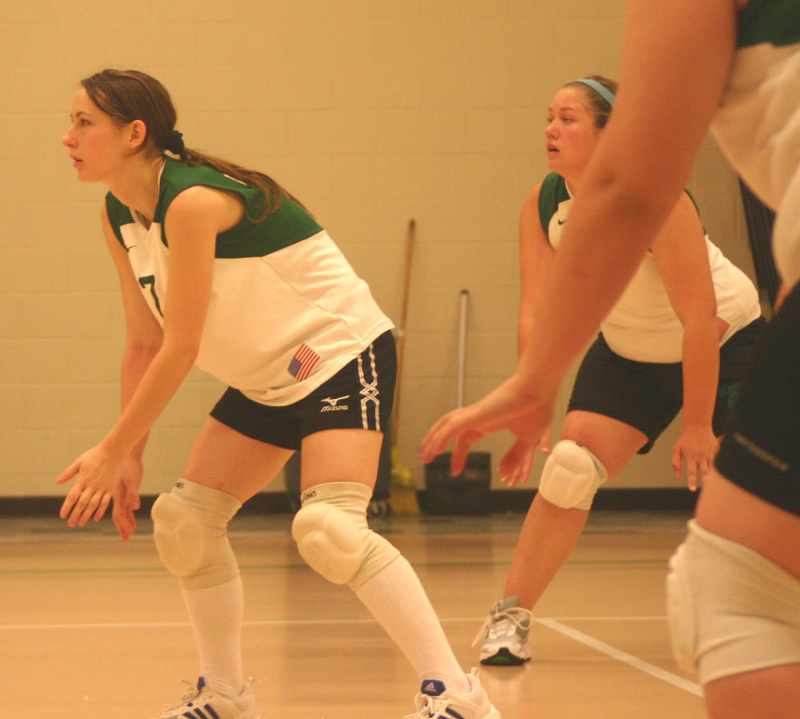 The game scores were 25-14,21-25, 25-15,23-25. After winning the 1st and 3rd games, but losing the 2nd and 4th, we again played a tie-breaker. We won 15-11! Saturday's win was crucial in order for our team to have a chance at 1st place in the League. All in all, a very exciting weekend of volleyball. I'm proud of my team for never giving up and playing hard. It was important to get the win on Saturday and everyone worked together to be successful. We're hoping all league schools will start posting their results. Our breakdown at Mackinac came down to us not playing a very defensively minded game and being unable to contain Junior Robert Chambers who had a lot of speed. Eric was injured shortly before half time which forced Cameron to play goal instead of defense, he is one of our most skilled defensive players. It was also unfortunate not to have Dan on the trip with us (ineligible) as his talent and leadership are much needed on the field! So we came away with 2 losses. Against Hannahville, although they were much weaker than Mac, we played much better as a team passing the ball, looking for a good pass instead of just throwing the ball away. I was much happier with the senior leadership on the field and the way we played as a team instead of 10 individuals. We are still working very hard to work better as a team though! Scorers over the Hannahville weekend were; Friday: Final score 6-0 Goals - Bryan (1), Dereck (1), Dan (4). Assists - Brenden (2), Dereck (2). Eric gained his first shut out of the weekend. Saturday: Final score 7-0 Goals - Brenden (2), Dereck (1), Kristy (1), Eric (1), Ryan (2). 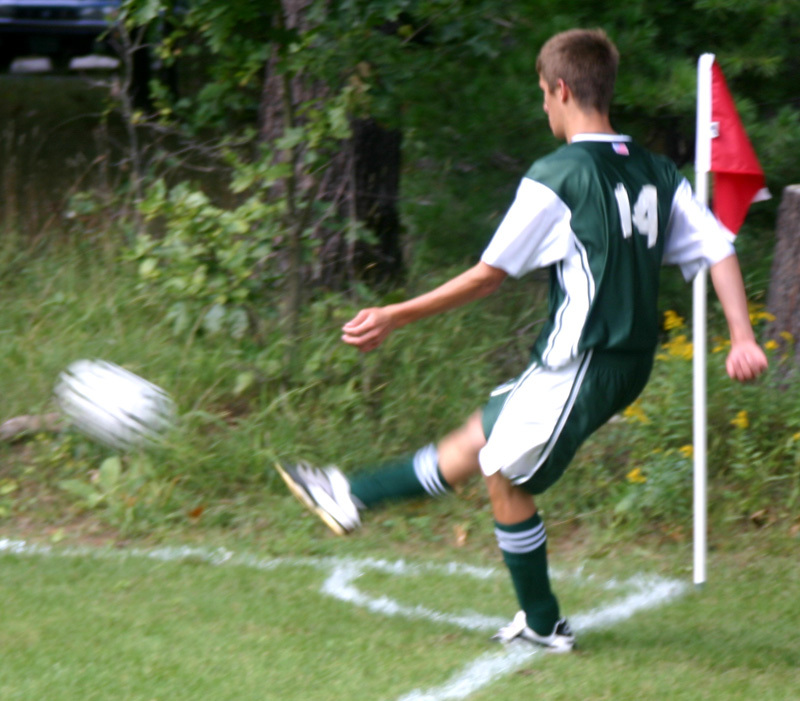 Assists - Brenden (2), Dereck (1), Eric (1), Dan (1). Eric and Maeve shared the shut out honors. This past weekend at Paradise was a little different story in ability level. 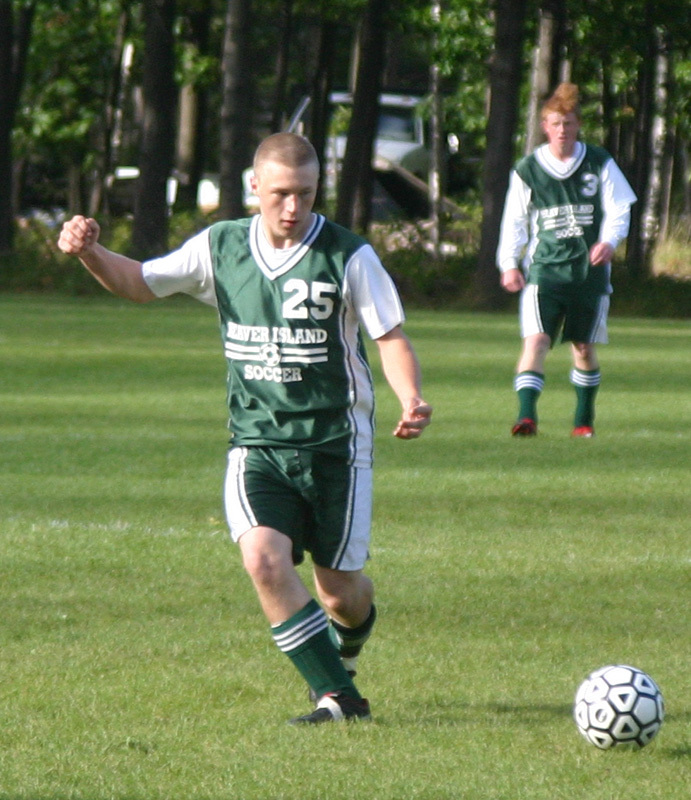 Paradise came into the games unbeaten (they tied Grand Marais) looking to keep their unbeaten status. We fell behind during both games very early but the Islanders were able to work together, come from behind and win both games. Friday stats: Final score 4-2 Goals - Dan (1), Bryan (1), Brenden (2). Assists - Dan (1), Dereck (1), Bryan (1). Eric came up with 12 saves (includes 2 incredible penalty kick saves) only allowing 2 goals. Saturday stats: Goals - Dan (1), Brenden (3). Again, Eric allowed only 2 goals with 12 saves. Eric's leadership from the goal has been unmatched by any other goalie in the league, his vantage point on the field and assistance to all the players is great. The wins against Paradise were great wins to have under our belt!